Digimon Adventure takes place before season 1. 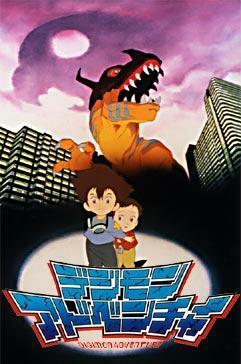 This movie shows the digidestined's first encounter with digimon. Tai and Kari find an egg that hatches into a Botamon. As they feed it Botamon digivolves into Koromon. One night he digivolves into Agumon, and heads for the streets with Kari. Tai goes looking for her and finds out Agumon has caused a lot of damage. A hole opens up in the sky and Parrotmon flies into the real world. He begins to fight Agumon. Agumon digivolves again into Greymon and is able to defeat Parrotmon. Both digimon are sent back to the digital world. 1. The Koromon in this movie is NOT Tai's Koromon. 2. The Agumon in this movie is much bigger than a regular Agumon. 3. The other digidestined are shown in the end of this movie. 4. Info from this movie is shown in the Myotismon Story Arc and in more detail in episode 45 of season 1.